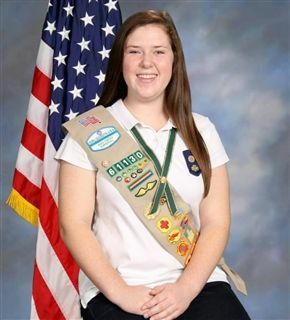 ﻿Congratulations to Class of 2015 graduate Paige Miller, who received the Girl Scout Gold Award - Girl Scouts' highest honor -for her outstanding leadership and commitment to community service. Only five percent of Girl Scouts nationwide achieve the Gold Award level of recognition. Paige's Gold Award project involved creating after-school programs in the U.S. and India to spark girls' interest in science, technology, engineering and math. She received the award last week during a ceremony at Irwin M. Jacobs Qualcomm Hall. Nice work, Paige!